Katie Jenkins was in high school when she crafted her first piece of jewelry. She repurposed a gold-disc bracelet that was a little too gaudy for her taste into a simple chain necklace. She wore it to school and received so many compliments that her friends started asking her to make them one. She didn’t know then that a decade later, she’d start her own jewelry company. 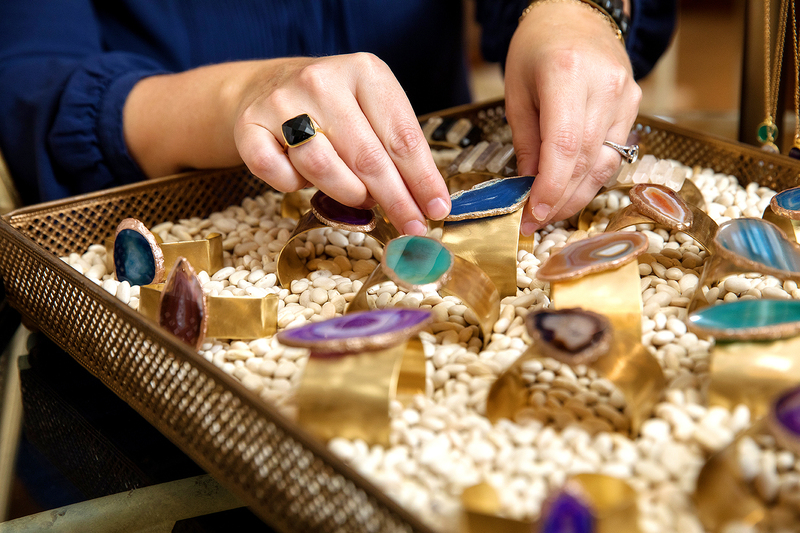 In 2014, Jenkins launched Kat Noel Designs, a line of agate cuffs, statement earrings and gold vermeil necklaces. Jenkins uses natural products for her jewelry. She orders drusy, agates and stalactites from South America and gemstones hand cut in India. She creates her rings, earrings and necklaces out of gold fill (layers of gold on sterling silver). Since no two crystals and stones are exactly alike, each of her products is unique. As she likes to tell it, the business was born out of necessity. At the time, she had three toddlers. “I felt like I could not leave my house,” she says. She decided she needed a hobby. That was when she stumbled upon handmade jewelry on Etsy. The pieces were a little pricey, in her opinion, and she wondered if she could make her own. She began watching YouTube tutorials and tracking down wholesale materials. Her tagline back then? “Creating jewelry to preserve my sanity,” she laughs. Her first clients were her sister and her friends. Before long, word spread, and the orders came rushing in. She now sells online, at craft fairs and in select wholesalers across the state. She is most known locally for her brass gemstone cuffs. The experience has given Jenkins a whole new appreciation for jewelry and its ability to make any outfit feel polished. Today, she is wearing a chambray button-down over a solid olive green top and black jeans. But the outfit wouldn’t be complete, she says, without her blue gemstone cuff and a gold-leaf necklace she swears she hasn’t taken off in half a year. Originally from Birmingham, Alabama, Jenkins moved to Baton Rouge to attend LSU. There, she met her husband, a Baton Rouge native. She’s lived here 15 years now, and connecting with others in the local retail and maker community helps the Capital City feel even more like home for her. 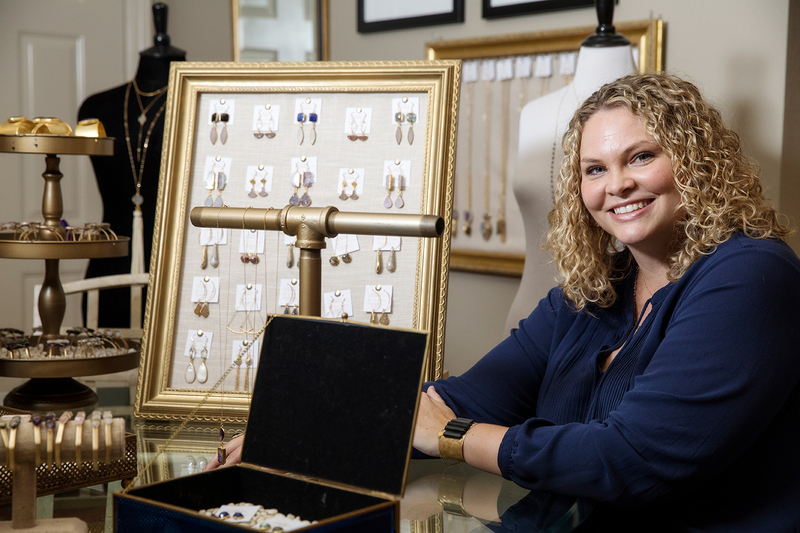 Whether she’s making a sale or just letting her girlfriends borrow one of her pieces for a wedding, Jenkins loves seeing how putting on her jewelry can give other women an instant boost of confidence. Jenkins sells her gold cuffs, earrings and necklaces at craft fairs, wholesalers across the state and on her website.